Law Central - Super Exposed: Is Your Super Protected? Super Exposed: Is Your Super Protected? 1. Super Exposed: Is Your Super Protected? Super is not the protected investment or strategy that most believe. Super is exposed. Super is protected from bankruptcy, but not before. Before bankruptcy your and your clients' super is exposed to tax debts and creditor claims. Traditionally, superannuation funds have been seen as an effective asset protection strategy because a person's interest in a super fund is not property that is available to a bankrupt's creditors. This protection comes from section 116(2)(d) of the Bankruptcy Act. But super is not safe in a pre-bankruptcy scenario. Commissioner of Taxation has power to issue garnishee notice? Yes. Not only does the ATO have the power to issue a garnishee notice to a super fund to recover any tax-related liability of a taxpayer, the Commissioner has told his staff to do this. In Practice Statement Law Administration PS LA 2011/18, the ATO staff has been told that " a garnishee notice in respect of any tax-related liabilities may be served on a superannuation fund. " This means that your and your clients' super is at risk prior to bankruptcy and a garnishee can be used to capture it. What is the effect of a garnishee notice? The amount of super money impacted by the garnishee notice, up to the debt claimed, is taken immediately. But first there must be a debt. Whether this is Court ordered or follows from an ATO notice of tax assessment, the debt can be claimed under a garnishee notice. This is a notice that requires anyone who holds money for the debtor/taxpayer to pay the money to the claimant/ATO. Again: what does the ATO say? "The garnishee ... will not be effective until the debtor's (member's) benefits are payable under the rules of the fund." And the corollary applies; that is, the garnishee is immediately effective when the debtor taxpayer's super benefits are payable to them! At that point, the super fund will be required to pay the garnisheed amount to the Commissioner. This concept of whether and when a benefit will be "due and payable" from the fund will depend on the rules of the fund, and this is the concept that is the key to the potential solutions. All and any that is currently due and payable. It does not matter if it is self-managed, multi-member or a small APRA fund; it is all capable of a garnishee claim. It also does not matter whether the fund benefit is a claimable lump sum or pension of any form; the amount of the benefit that is due and payable to the member-taxpayer is exposed to a garnishee claim. Be proactive now. Once a garnishee issues (whether ATO or creditor), there is virtually no scope to protect the super. Declaring bankruptcy is too late; once issued on the super it will already have been garnisheed. The key to enhancing super's pre-bankruptcy protection lies in the phrase "due and payable". It is only an amount that is "due and payable" from the super fund to the member that may be subject to a garnishee notice. Advised that super is a protected asset? If you have advised another that super is a protected asset you need to amend your statement of advice or recommendation. Any such earlier statement that did not limit itself to the post-bankruptcy situation was and is simply wrong. Why haven't you heard of this before? Rockwell Olivier are leaders in Australia's modern superannuation landscape. Soon you will hear of others warning of the garnishee risk but they, like you, will have heard it from us first. With a wealth of knowledge and expertise that has been developed since 1982, we apply exactly the same care and skill in the preparation of self-managed superannuation fund deeds as we do with publicly marketed and multinational employer superannuation funds prepared and updated by us. This article was written by Peter Bobbin, Jennifer Yeo & Matthew McKee from Law Central’s partner law firm Rockwell Olivier Sydney (formerly known as Argyle lawyers) www.rockwellolivier.com.au. The all new 2012/13 Trust Distribution Minutes Library is now available. 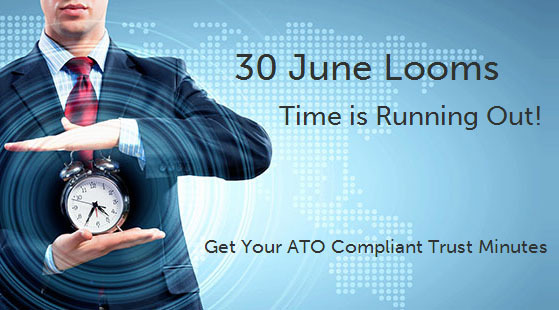 Prepared by specialist tax lawyer Martin McCoy, the 2012/13 minutes comply the latest rules and ATO guidelines and are presented with easy to follow instructions. This year, we have introduced two varieties of our trust distribution minutes. If you only need to prepare minutes for a single trust, then use our Trust Distribution Minutes Library for 2012/13 - Single-Use. If you need to prepare minutes for multiple trusts, then use our Trust Distribution Minutes Library for 2012/13 - Multi-Use. Remember trust minutes must be completed by 30 June.